Those who fight MS daily have a tremendous amount of strength and courage. They also have to have hope that some day a cure will be found. Our HOPE MS apparel will be perfect for your next MS walk or awareness event and will help spread a positive message. 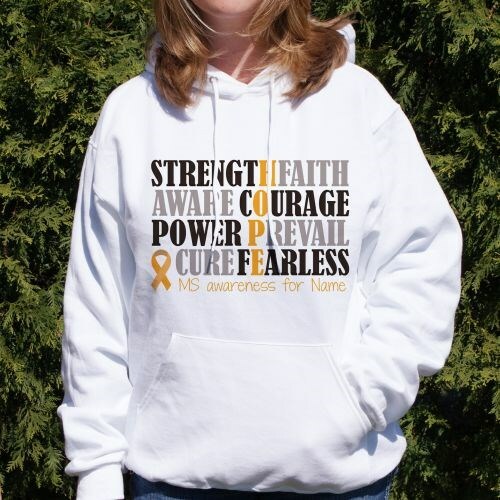 This MS Awareness design is printed on our 50/50 cotton/poly blend hooded sweatshirt, machine washable in youth sizes S-L & adult sizes S-2XL. Free personalization of any name is included. Wonderful. I ordered a hoodie from company 2 years ago and still looks great. Additional Info Shop for Multiple Sclerosis shirts for your next walk or fundraising event! Your team will look great and inspire others in our HOPE MS hoodie. Our MS Butterfly Ribbon Sweatshirt is another unique design option for your team.